Looking back at the twentieth century, as it is almost at its end, it has been marked by the bloodiest conflicts ever known to Humankind. From the death and destruction, the annals of history will forever manifest those who contributed to the barbarous events and those who attempted to resist the inhumane acts of aggressors. Belonging to the latter, one personality seems to stand out amongst the lot of humanitarians and peace loving people- Mohandas K. Gandhi. Although Gandhi was a remarkable nationalist leader, he was less concerned with the ends of his actions and more with the means of achieving independence for India. Gandhi believed in the idea of non-violent resistance and civil disobedience. These two elements of Gandhi’s plan for Indian Independence , stemmed from his philosophy of Satyagraha or soul force. When most nationalist movements of the twentieth century were being executed through the use of violence, Gandhi sought to employ a method that opposed the practice or the advocacy of violence to achieve political goals. His method was based on "Truth, Love and Self-suffering". It was through this method that any adversity could be conquered. By sacrificing one’s self to your opponent’s wrath without violent retaliation, your opponent would give in because of the commitment to self-sacrifice on the part of the Satyagrahis (Person practicing Satyagraha). Gandhi utilized this method of Soul Force to achieve political reform in South Africa, independence in India and to transform himself into the person that he wanted to be. Gandhi’s methods gained him tremendous praise from people worldwide, including his adversaries and served as a catalyst for the mass movement towards ending the British Raj. Long after Gandhi’s assassination, Gandhi and his ideas are still admired for their humanitarian and almost saintly attributes. Some revere Gandhi "…as perhaps the greatest figure of the last nineteen hundred years", while others have made serious criticisms of his ideas and methods. Rajani Palme Dutt, saw Gandhi’s actions as a method of protecting the interests of the Bourgeoisie in India during a time of uncertainty. K. Sarwar Hasan contests that Gandhi’s political ideas and actions based on Hindu doctrine alienated the Muslims of India. Hindu Nationalist V. D. Savarkar , thought that Gandhi’s methods contradicted the religious outlook of Hinduism and jeopardized Hindu political interests as well. The leader of The All Indian Depressed Class Federation and "Untouchable" , B. R. Ambedkar contends that Gandhi was a proponent of the Caste System and an antagonist towards progress that would have benefited all of India, especially the depressed classes. These men set forth a plethora of strong criticism against a man who was simply searching for the truth. It will be the goal of this work to answer these criticisms, when possible, through the use of Gandhi’s ideas and historical fact. Dutt construes a Marxist view of Gandhism and contends that Gandhi’s methods were not as altruistic as they appeared to be. These methods were a means of protecting the privileges of Indian landlords and Bourgeoisie that were being jeopardized by the unbridled force of the common masses. "Non-violence" is seen as a design , constructed and utilized to restrain this force that struck fear into the hearts of the landed class and to harness the force of the masses to compel the British to make concessions. When the Rowlette act was passed in 1919 it added to the atmosphere of dissatisfaction among the Indian people. At the end of World War I many Indian people expected civil liberties to be restored . The Rowlatt act was in favor of continuing the "war time vigors".1 This act caused widespread unrest and strikes in India. Dutt claims that it was Gandhi’s primary intention to utilize civil disobedience and non-violence to stop the civil unrest and strikes. The Rowlatt act and its reforms had at first been accepted by Gandhi and the Congress. Once the violence erupted, Gandhi and congress shifted their positions and assumed the leadership role of the mass movement. This was done because the members of Congress , the Bourgeoisie, were worried about the violent masses turning against them. So, Gandhi planned a program of "Non-violent non-cooperation" to cope with this matter. It would be the middle-class that would spear-head the movement while the masses were supposed to resort hand spinning, weaving and non-payment of taxes. This plan is perceived by Dutt as a scheme to eliminate the possibility of the masses posing a threat to the landed class. The change in the position of Congress in reference to the Rowlatt, was accompanied by another phenomenon. Congress ceased to be just an organization of self-government with in the British empire but it transformed itself into a modern political party that was leading the masses into a struggle against the British. Like any other political party, Congress was bent on protecting their interests. Non-violent rhetoric "was an attempt to conciliate the interests of the masses with the big bourgeoisie and landlord interests which were opposed to any decisive mass struggle. "2 Dutt believes this became more obvious after the Chauri Chaura incident in which peasant rioters killed a group of policemen and Gandhi subsequently withdrew his support for the movement. The fact that Gandhi withdraws his commitment to the movement by calling off the entire campaign and then substitute his original strategy with the "Constructive Program" indicates to Dutt that the Bourgeoisie was losing control of the movement and would attempt to regain it by calming the masses.3 Dutt is critical of Gandhi’s actions that resulted in the suspension of the mass movement. Gandhi claims that he suspended the movement to end the violent outbreaks associated with it. Dutt believes that the Bardoli decision/resolution had an economic motive. Since the movement was cancelled at " the height of public enthusiasm" it is an indication to the Marxist that the interests of the Bourgeoisie were being jeopardized. The enthusiasm and force of the masses at this time was potent enough to sweep away imperialism and might have done the same to landlordism in the process. This opinion is supported by the fact that the Ryots (peasants) had been instructed to resume the payment of taxes and rent once the mass civil disobedience movement was suspended. Dutt thinks that the resolution instituted by the Working Committee at Bardoli has little relation to the outbreak of violence. Three of its seven clauses specifically refer to the payment of rents by the peasants to the landlords. His conclusion is that this was a question of class interest and not a matter of suppressing the violence for its own sake. Non-violence is held to be disguise for class interest and to serve as a leash for the masses’ activities that might have been counter productive to the interests of the propertied class. The keystone to this argument is that the payment or non-payment of taxes and rents is totally unrelated to the presence of mass hysteria, yet it was a major issue in the aftermath of this movement. Dutt sees Gandhi as " an ascetic defender of property…" because he uses "…the most religious principles of humanity and love to disguise his support of the property class." Gandhi is reduced to a " tool or mascot of the Bourgeoisie in every wave of the Indian struggle" It was Gandhi who was able to attracted and guide the masses when the Bourgeoisie leadership failed to do so. He was able to harness the enthusiasm of the people in order to gain concessions from the British and also keep the masses in check by preventing a class revolution in India through the use of his non-violent philosophy.4 Further evidence to support Dutt’s opinion that non-violence was not a means of achieving independence but a method of maintaining leadership and bourgeois position is the salt march of March 1930. Gandhi limited this campaign to himself and his chosen disciples. It was by his instruction that the masses , including industrial workers were asked to be patient and continue the work of the "Constructive Program". In short, Dutt believes that Gandhi manipulated the masses by calling them to action when favorable to the bourgeoisie and then withdrawing his support if things got out of hand. Dutt claims this was the case in 1932, when Gandhi abandoned the movement once more to tend to the cause of the Harijans. If Gandhi did remove his support from any civil disobedience movement it was only because it became marred with acts of violence perpetrated by his fellow countrymen. Gandhi best explains his own actions by stating " if I can have nothing to do with the organized violence of the government, I can have even less to do with the unorganized violence of the people. "10 Non-violent non-cooperation was not just a method of achieving Swaraj but a method of resisting evil . Gandhi did not distinguish between violent acts committed by Indians or Englishmen, to him they are equally evil. It is obvious that a Marxist would be an opponent of Gandhism, and it come as no surprise that K. Sarwar Hasan, a Pakistani Muslim would also portray Gandhi’s ideas and actions in a negative light. Gandhi’s failure to attract a large Muslim following was his downfall according to Hasan. This deficiency was due to Gandhi’s inability to understand and gratify the needs of the Muslim population in India. This became evident in 1919 when the terms of the Treaty of Sevres became known to India’s Muslims. This treaty proposed a dismemberment of the Ottoman Empire and caused general unrest amongst Muslims in India. Hasan’s contention is that Gandhi only took action on this matter because he felt forced to do so and it was an opportunity to address issues that concerned Hindus as well. "Gandhi consolidated joint grievances and proposed that congress should launch a campaign of mass non-cooperation. "11 Gandhi’s proposal received opposition from Muslims, like Jinnah who saw Gandhi’s "soul force" as a tree that would bear no fruit. The slow going pace of Gandhi’s methods would only increase the divide between Muslims and Hindus since his method possessed an ideological foundation based on Hinduism. Muslims like Jinnah believed if mass support was to be gathered for the cause of independence, it had to be done quickly. Hasan’s most stalwart criticism is that Gandhi utilized the Hindu religion and traditions to guide the quest for India’s independence. Gandhi’s inspiration and language, that was associated with the movement, were products of Hindu scriptures like the Gita. India’s independence was referred to as Ram Raj (Rule of God-Hindu god Rama) and the struggle itself was referred to as dharma yudh (Hindu religious war). These associations with Hinduism coupled with the fact that Gandhi was a Hindu repelled Muslims. According to Hasan it was Gandhi’s desire to establish an independent India that was free of western models. This ruled out the possibility of independent India becoming a secular state. The Muslims wanted a secular state established to ensure that their religious rights would not be trampled on. Hasan believes that Gandhi could have done more to solidify Hindu-Muslim relations. He sees Gandhi’s actions as futile attempts to appease Muslims and contends that nothing concrete was ever offered to Muslims. The fact that Gandhi was unable to rally enough Muslim support is not his downfall alone. Culpability can be found with the Muslims themselves. The fact that the Muslim community disapproved of Jinnah’s joining of the Indian National Congress is proof enough that the divisions were not caused by Gandhi’s actions alone, not to mention the historical rivalry. Gandhi’s intentions and actions illustrate that he did not just placate the Muslims but truly desired to form a united India. Gandhi treated Muslims as his equals. This was evident in South Africa as well as India. A main provision of his Triple Program was his commitment to strengthen Hindu-Muslim unity. He was a firm believer in the philosophy of the majority having respect for the minority. He considered Hindus and Muslims "natural brothers of India" and thought that it was more surprising to see them feud than if they should unite. His entire equation of a free India was based upon the notion of a "brotherhood of man". No distinctions were made between Hindus or Muslims or any other religion or race for that matter. On the eve of partition, Gandhi still advocated brotherhood between the two groups even though the splitting of India was the cause of severe disappointment for him.12 Hasan’s claim that Gandhi saw the independence movement as a Hindu Holy war is a nearsighted judgement. Gandhi was simply expressing his feeling and ideas in a medium that he was most familiar with-Hinduism. If Gandhi did disagree with Muslim opinions at times it was only because they contradicted his creed of Ahisma and Satyagraha and his vision of an independent India. Not to mention that it was not only Muslims that Gandhi disagreed with. Hindu nationalists as well as Muslim nationalists set forth staunch opposition to Gandhi’s plans and ideas. Gandhi’s actions seemed extremely unorthodox to many Hindus. V. D. Savarkar, a Hindu nationalist, saw Gandhi as a threat to the existence of Hindus in India. Savarkar believed that Gandhi’s influence over Congress hurt the Hindu cause, because Gandhi gave in to Muslim demands. Gandhi supposedly jeopardized Swaraj by taking up the Khilafat issue. Muslim leaders in India tried to coerce Amir Nuillakhan of Afghanistan to invade India. Gandhi was aware of this vision to establish an Afghanistanian kingdom in India, yet did not distance himself from those that supported this invasion. In short, Gandhi’s continual appeasement of the Muslims endangered the interests of Hindus according to Savarkar. This criticism serves to calcify the previous argument that Gandhi was in favor of a united India and had no ill will towards the Muslims or their interests. Gandhi probably would not have minded if a Muslim was head of the government as long as he shared the same views on brotherhood and equality among all people as Gandhi did. Gandhi did say that "Muslims in India were once Hindus, they just accepted Islam. "13 Savarkar’s criticisms stems from the criticisms that Gandhi made about Hindus that suggested that they were too closed minded to accept Muslims as their brothers and fellow countrymen. Criticism directed at Gandhi seems expected from the three previous sources, criticism from an Untouchable seems surprising. B.R. Ambedkar is under the impression that Gandhi was an advocate of the caste system. Gandhi saw the caste system as the backbone of Hindu society and did nothing to put an end to this evil practice even though it was the cause of misery for the Untouchables that Gandhi was supposedly trying to help. Ambedkar attempted to support his claims by stating that Gandhi believes that "intermarriages were not necessarily for national unity, that dining together does not create peace and that the abandonment of the caste system in favor of a social system based on western ideals was a detriment to all. Ambedkar assumes that Gandhi is undemocratic in thought because he opposes a social system similar to that of western nations that made discrimination illegal. Gandhi was correct in his assumption that peace and brotherhood would not be a product of intermarriages, dining together and the adoption of a social system based on a western model. In Gandhi’s view all these things were useless if there was not a change in the conscience of Hindus. No law can force someone not to discriminate, only one’s own convictions could do that. Ambedkar’s assumption that a social system based on western ideals would bring about "civilization" in India was held in contempt by Gandhi. To Gandhi, civilization was equated with good conduct. Western culture was plagued by various maladies such as materialism, competition and overindulgence. An assimilation in that direction would only hurt India and the depressed classes. Industrialization as advocated by Ambedkar would only cause the further exploitation of the Untouchables. Labor saving machines would result in more unemployment, further starvation, poverty and homelessness. It would provide benefits for the few and suffering for the many. Gandhi believed progress would not be thwarted by the refusal of labor saving machines because the only progress that mattered was that that considered all people. To Gandhi, progress is only progress if all Indians progressed together. The only device that considered the needs of all Indians was the spinning wheel. With it people could become self sufficient and labor for their benefit. Gandhi was an ordinary man who had great ideas. These critics misunderstood many of Gandhi’s ideas. Their lack of comprehension is the cause of their criticisms. Their lack of vision is the cause of these criticisms. Gandhi was a dreamer and these men did not share the same dreams as Gandhi. It is no secret that Gandhi’s ultimate dream did not come true- an independent united India. Does this mean that "the method" failed? Gandhi believed "the method" could never fail since it was a method of truth and love. If anything failed, he admitted "…I did. "17 In his life long search for the truth he like any other human being made mistakes and attracted criticisms. Even if these criticisms were all true, does that negate what Gandhi did for India and humanity? M. K. Gandhi, The Essential Gandhi, ed. Louis Fisher (New York: Vintage Books, 1962), 146. Gandhi, M. K. The Essential Gandhi. Edited By Louis Fisher. New York: Vintage Books, 1962. Brown, Judith M. Gandhi, Prisoner of Hope. New Haven: Yale University Press, 1990. Gandhi, M. K. The Collected Works of Mahatma Gandhi. New Delhi: Government of India, Publications Division, Vol. XI, 1964. 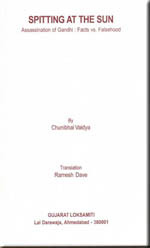 Ray, Sibnarayan. Ed. Gandhi, India and the World. Philadelphia: Temple University Press, 1970.